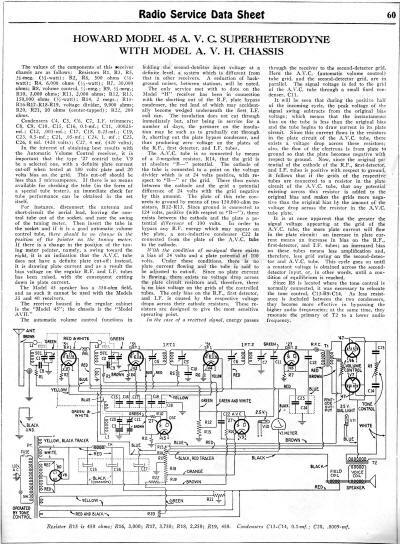 Once again I have given selflessly and freely of my time and talent to make available resources to those seeking certain knowledge regarding vintage radio circuits ;-) This time it is the Radio Service Data Sheet for the Howard Model 45 A. V. C. Superheterodyne with Model A. V. H. Chassis. 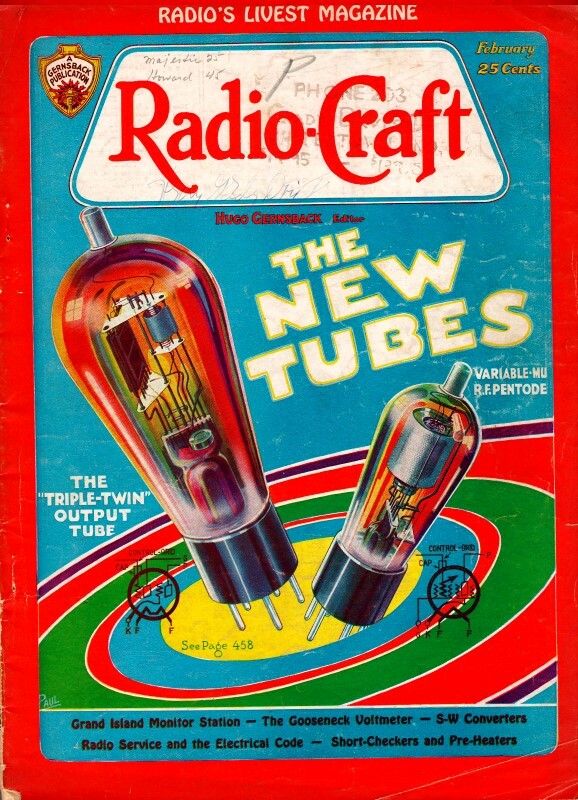 The info was published in a 1932 edition of Radio-Craft magazine, one of Hugo Gernsback's many endeavors. 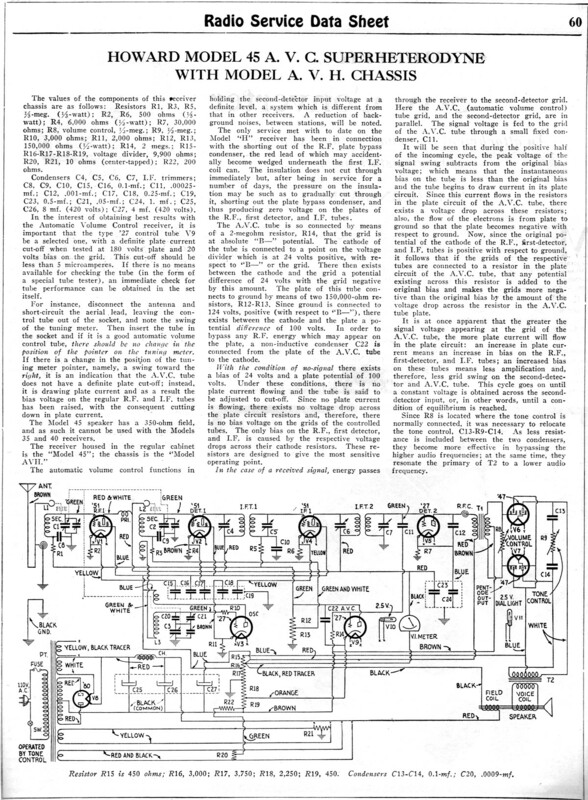 Also on the page is a complete list of all such schematics and tuning and repair data posted thus far. The values of the components of this receiver chassis are as follows: Resistors R1 , R3, R5, 1/5-meg. (1/3-watt); R2, R6, 500 ohms (1/5-watt); R4, 6,000 ohms (1/2-watt); R7, 30,000 ohms; R8, volume control, 1/2-meg. ; R9, 1/2-meg. ; R10, 3,000 ohms; R11, 2,000 ohms; R12, R13, 150,000 ohms (1/2-watt); R14, 2 megs. ; R15- R16-R17-R18-R19, voltage divider, 9,900 ohms; R20, R21, 10 ohms (center-tapped); R22, 200 ohms. Condensers C4, C5, C6, C7, I.F. trimmers; C8, C9, C10, C15, C16, 0.1·mf. ; C11, 0.00025-mf. ; C12, 0.001-mf. ; C17, C18, 0.25-mf. ; C19, C23, 0.5-mf. ; C21, 0.05-mf. ; C24, 1.0 mf. ; C25, C26, 8 mf. (420 volts); C27, 4 mf. (420 volts). In the interest of obtaining best results with the Automatic Volume Control receiver, it is important that the type '27 control tube V9 be a selected one, with a definite plate current cut-off when tested at 180 volts plate and 20 volts bias on the grid. This cut-off should be less than 5 microamperes. If there is no means available for checking the tube (in the form of a special tube tester), an immediate check for tube performance can be obtained in the set itself. For instance, disconnect the antenna and short-circuit the aerial lead, leaving the control tube out of the socket, and note the swing of the tuning meter. Then insert the tube in the socket and if it is a good automatic volume control tube, there should be no change in the position of the pointer on the tuning meter. If there is a change in the position of the tuning meter pointer, namely, a swing toward the right, it is an indication that the A. V. C. tube does not have a definite plate cut-off; instead, it is drawing plate current and as a result the bias voltage on the regular R.F. and I.F. tubes has been raised, with the consequent cutting down in plate current. The Model 45 speaker has a 350-ohm field, and as such it cannot be used with the Models 35 and 40 receivers. The receiver housed in the regular cabinet is the "Model 45"; the chassis is the "Model AVH." The automatic volume control functions in holding the second-detector input voltage at a definite level, a system which is different from that in other receivers. A reduction of background noises, between stations, will be noted. The only service met with to date on the Model "H" receiver has been in connection with the shorting out of the R.F. plate bypass condenser, the red lead of which may accidentally become wedged underneath the first I.F. coil can. The insulation does not cut through immediately but, after being in service for a number of days, the pressure on the insulation may be such as to gradually cut through it, shorting out the plate bypass condenser, and thus producing zero voltage on the plates of the R.F., first detector, and I.F. tubes. The A. V. C. tube is so connected by means of a 2-megohm resistor, R14, that the grid is at absolute "B-" potential. The cathode of the tube is connected to a point on the voltage divider which is at 24 volts positive, with respect to "B-" or the grid. There then exists between the cathode and the grid a potential difference of 24 volts with the grid negative by this amount. The plate of this tube connects to ground by means of two 150,000-ohm resistors, R12-R13. Since ground is connected to 124 volts, positive (with respect to "B-"), there exists between the cathode and the plate a potential difference of 100 volts. In order to bypass any R. F. energy which may appear on the plate, a non-inductive condenser C22 is connected from the plate of the A. V. C. tube to the cathode. With the condition of no-signal there exists a bias of 24 volts and a plate potential of 100 volts. Under these conditions, there is no plate current flowing and the tube is said to be adjusted to cut-off. Since no plate current is flowing, there exists no voltage drop across the plate circuit resistors and, therefore, there is no bias voltage on the grids of the controlled tubes. The only bias on the R.F., first detector, and I.F. is caused by the respective voltage drops across their cathode resistors. These resistors are designed to give the most sensitive operating point. In the case of a received signal, energy passes through the receiver to the second-detector grid. Here the A. V. C. (automatic volume control) tube grid, and the second-detector grid, are in parallel. The signal voltage is fed to the grid of the A. V. C. tube through a small fixed condenser, C11. It will be seen that during the positive half of the incoming cycle, the peak voltage of the signal swing subtracts from the original bias voltage; which means that the instantaneous bias on the tube is less than the original bias and the tube begins to draw current in its plate circuit. Since this current flows in the resistors in the plate circuit of the A. V. C. tube, there exists a voltage drop across these resistors; also, the flow of the electrons is from plate to ground so that the plate becomes negative with respect to ground. Now, since the original potential of the cathode of the R.F., first-detector, and I.F. tubes is positive with respect to ground, it follows that if the grids of the respective tubes are connected to a resistor in the plate circuit of the A. V. C. tube, that any potential existing across this resistor is added to the original bias and makes the grids more negative than the original bias by the amount of the voltage drop across the resistor in the A. V. C. tube plate. It is at once apparent that the greater the signal voltage appearing at the grid of the A. V. C. tube, the more plate current will flow in the plate circuit: an increase in plate current means an increase in bias on the R.F., first-detector, and I.F. tubes; an increased bias on these tubes means less amplification and, therefore, less grid swing on the second-detector and A. V. C. tube. This cycle goes on until a constant voltage is obtained across the second-detector input, or, in other words, until a condition of equilibrium is reached. Since R8 is located where the tone control is normally connected, it was necessary to relocate the tone control, C13-R9-C14. As less resistance is included between the two condensers, they become more effective in bypassing the higher audio frequencies; at the same time, they resonate the primary of T2 to a lower audio frequency.